Coca-Cola’s “It’s the Real Thing” ad: How the McCann Erickson ad changed American advertising—and America. The following is an excerpt from Jeff Chang’s Who We Be: The Colorization of America. From the turgid summer of 1971 through the terrible autumn of 1972, TV newscasts must have seemed unrelenting: millions marching to stop the war, prisoners attacked at Attica, the Watergate scandal and the Pentagon Papers, the Manson and Serpico and My Lai trials, guns in Munich, bombs in D.C., and troops in Derry. Pain and hatred and misery. Where was the harmony, sweet harmony? It was in the ad-break, in a commercial for Coca-Cola. The spot begins with a blonde woman, eyes clear blue, lip-syncing a strange lyric, “I’d like to buy the world a home, and furnish it with love.” There is an even weirder second line, about growing apple trees and honeybees and snow-white turtledoves. The camera pans across rows of young singers smiling with the rising sun—Spanish, Swedish, Nigerian, Nepalese, dressed in a dashiki, a kimono, a dirndl, a Nehru, a turtleneck. Together they lip-sync, “I’d like to teach the world to sing in perfect harmony.” Each holds a green glass hobble skirt bottle in their right hand, one branded in English script, the next in Arabic, another in Thai. “I’d like to buy the world a Coke,” they sing, “and keep it company.” The camera pulls up to an aerial view, revealing 200 singers aligned on a green hillside like an open fan, a youth chorus of the world. The campaign’s code name was “Buy the World,” the budget for this commercial alone was nearly $1.3 million in 2013 dollars, and through it Coke might have a shot at more than just glass-bottle redemption. Imagine, in a season of racial division, imperialist deception, capitalist malaise, and national despair the whole world gathered upon a hill sharing a fizzy brown drink. It might look like a picture of renewed American faith. Buying a Coke was like buying the world shelter and peace. 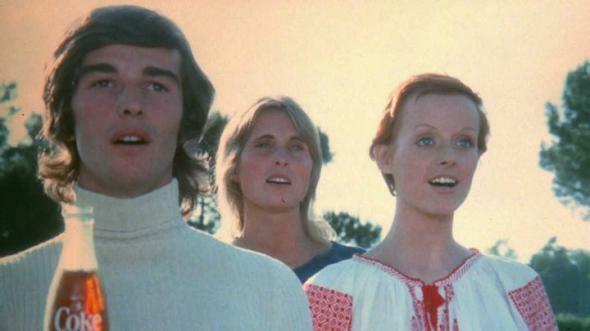 The hilltop commercial was among the first that Coca-Cola shot in full color. More important, it was perhaps the nation’s first colorized one—an unusual advertisement that admitted a possible multicultural future beyond whiteness. Conceived during the fall of 1968, the Real Thing commercials would incept the drink into a new dream of America, in which divisions between young and old, counterculture and mainstream, Black and white, poor and rich, liberal and conservative had been resolved. In this era of fragmentation and unrest, it was time for the universal drink, like Brand U.S. itself, to reassert some alpha swag. Now at the start of the 1970s, McCann-Erickson was sending teams of photographers and art directors again into the great land. Their mission was to capture—or to stage—slices of American life far from the cultural battlefronts. The earliest Real Thing spots, which began airing in 1969, were montages of these images. In the closing voice-over of “Friendly Feelings,” a narrator declared, “A bottle of Coke has brought more people together than any other soft drink in the world.” Bill Backer and the young staff at McCann-Erickson finally were ready to meet BBDO’s challenge. But they also seemed to want to address something deeper: what it meant to be an innocent American bumbling through a suddenly very big and dangerous world. It was Backer who first saw the outlines of racial harmony and world peace in a green bottle of brown bubbly sugar water. His epiphany came out of a disrupted airline flight. Two weeks before the debut of “Friendly Feelings,” Backer was on his way to meet his songwriting collaborators in London. But he found himself grounded by Heathrow fog at the tiny Shannon Airport outside Limerick, Ireland. Passengers, mostly high-maintenance business travelers, were forced to double up overnight at an overcrowded motel, a situation accepted mostly with reluctance and not a little petulant acting out. The next morning Backer took a seat in the airport restaurant and looked at the crowd. The night before they had been at each other’s throats. Now they were all conversing in English, laughing together. And they seemed to be drinking bottles of Coke. Backer was struck by the notion that Coke was “a tiny bit of commonality between all peoples, a universally liked formula that would help to keep them company for a few minutes.” He started scribbling ideas on a napkin. Working quickly, they got British folksingers the New Seekers to record the song and brought it to radio. Coca-Cola’s bottlers hated it, company president Paul Austin thought it was too sentimental, and listeners were unmoved. But somehow the agency prevailed in getting more money to turn the jingle into a television commercial. A young McCann-Erickson employee named Harvey Gabor suggested an idea for the “First United World Chorus” singing the song. Medium Cool director Haskell Wexler signed on to direct. They returned to England to shoot, a globalized production assembling the diversity of the Old World to comfort the anxious masses of the New. London brought bad weather so they moved to Rome. This first shoot was a disaster, a telling one. An Italian production company brought in 1,200 young extras from local orphanages. As the sun grew hotter, the orphans were kept locked in steaming buses. By noon the bored, parched teens were rocking the buses off their axles and wolfishly eyeing the big truck full of Cokes parked at the bottom of the hill. At the top, Davis stood on a conductor’s ladder, struggling to teach the united world chorus how to mouth lyrics in a language many did not speak. For the final scene—an aerial shot of the orphans cheering alongside the united world chorus—the teens were released from their buses. They raged loud and broad across the field. A beleaguered team of marshals finally corralled and herded them into place near the chorus. There the orphans took the glass bottles they had been handed and with an angry roar began flinging them at the director’s helicopter overhead. Then they stormed down the hill toward the Coke truck and tried to overturn it. Where was the harmony? It had been interrupted by a teenage riot worthy of Black Friday. Perhaps this, too, was what American exceptionalism looked like. The next day Wexler, still angry he had nearly been toppled from the sky to certain death over a stupid Coke commercial, fled the set, never to return. With a different crew and production company, a much smaller cast, and a different Italian location, the spot was finally completed. The “Buy the World” commercial was released in Europe, mostly to indifference. But in the United States the TV spot found huge success. Coca-Cola was suddenly flooded with letters of gratitude and requests for lyrics and sheet music. As Tom Clay’s “What the World Needs Now Is Love” fell off the Billboard charts, two different versions of “I’d Like to Teach the World to Sing (In Perfect Harmony)” took its place. In the end both topped the charts not just in the United States, but around the world, including Europe. America was still losing the war in Southeast Asia, but it was back to winning hearts and minds at home and abroad. In 1939, near the end of the Great Depression, Coke had run print ads titled “The drink everybody knows …” that collected illustrations of Americans at work and at play. There were airline pilots and stewardesses, young female shoppers, baseball-playing kids, courting teens, a homemaker, a snow-shoveler. Except for a smiling Pochontas-type Indian sharing a drink with a young little rosy-cheeked cowboy, all of the subjects were white. Each illustration represented a frontier closed and a market opened. Together they pointed forward toward the affluent society and Kennedy’s suburban New Frontier. At the start of the 1970s, at the end of the long postwar economic boom, Buy the World pictured the last frontier. Each smiling young person on the Italian hill—marked by their race, nation, and culture—held a market in their hand. It was a primitive picture, to be sure, a couple hundred smiling stereotypes, a stock sheet of misrepresentations. But it was not dishonest. In the eyes of capital, nonwhites and non-Americans represented the last to be brought inside, organized, harmonized. As the American Century roared to a close, capitalism’s destiny would belong to identity. Buy the World had stumbled upon a key to unlocking not just for Coca-Cola, but all of American business, the young world of the coming Global Century. From capital’s dream of one America, a New World Order might be born. But it would be decades before many realized that such a world was even possible. Copyright 2014 by Jeff Chang. From Who We Be: The Colorization of America. Reprinted with permission. Read an interview with Bill Backer, the man who created the famous Coca-Cola commercial.